The present users of ELEX EasyPost Shipping Method for WooCommerce would know that the plugin does a wonderful job for stores located in the USA. It has been used for getting domestic and international shipping rates, printing labels and automatic tracking. The plugin combines services from USPS, FedEx, and UPS to your WooCommerce store. For someone referring EasyPost for the first time, it is an advanced integration of 100+ carriers through one RESTFul API. Inside of WooCommerce the plugin currently integrates FedEx, UPS, and USPS services. Create scan forms for large shipments. and all of these from within WooCommerce, which means you don’t have to use a different setup of each one of them. Not much before, the plugin got a revival with the addition of some useful features. Let’s explore. This has been a combination of a few important changes. The plugin saw major UI changes that make it easier for store owners to use the plugin. One of the most important of them all is the introduction of Sender Country Field. As you know without this option, the EasyPost Shipping Method was somehow restricted to the United States only. With the introduction of this, WooCommerce store owners, from around the globe, can now use this plugin to ship their products to any part of the world. Or you can set a different sender country and operate from a different country. You can consider a type of drop shipping. Let’s see three situations where this is going to help businesses and customers. In this situation, any store in the USA wants its production house located in Australia to ship a parcel to customers back in the United States. The store owner can simply set the sender location to Australia with the address. Any customer in the United States can order the product and as per the setting is done, either FedEx or UPS is going to deliver the product from Australia. The screenshot below shows FedEx and UPS services show to a customer. EasyPost Shipping Rates for shipments sent from a country other than the US. In this case Australia. In this situation, the WooCommerce store currency is USD being based in the USA and he wishes to ship a product to his customer in India. But the product is again in Australia. Just like the previous condition, the EasyPost Shipping Method comes as a savior. 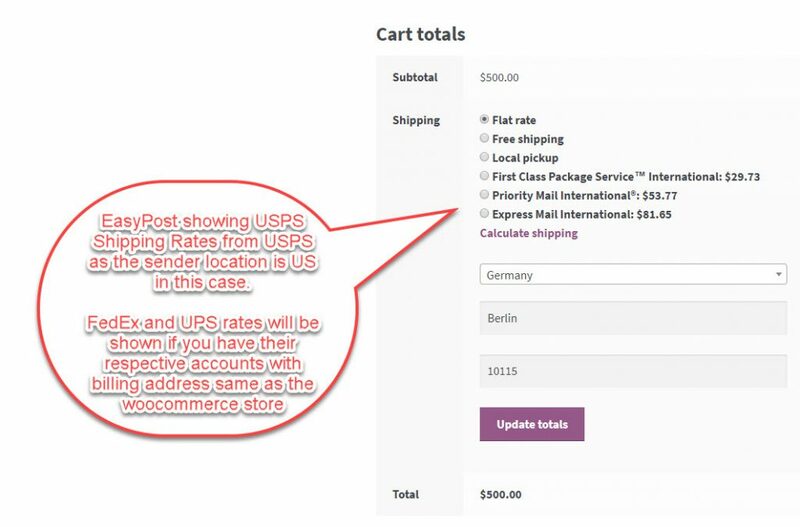 The plugin offers shipping rates to the customer in other countries other than the default WooCommerce location. In this way, you can keep the store location to your currency and ship the product form a different location. 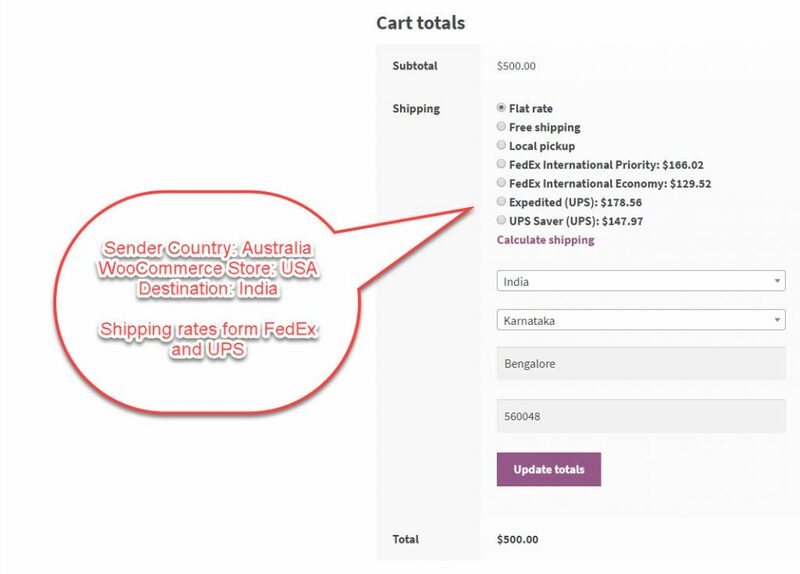 The screenshot below shows rates shown to a customer in India, with WooCommerce store location of USA and product being shipped from Australia. Again the USPS rates will not be shown as the sender location is not set to the USA. Cart Page show FedEx and UPS International shipping rates only. USPS rates are not shown as the product is being shipped from Australia. 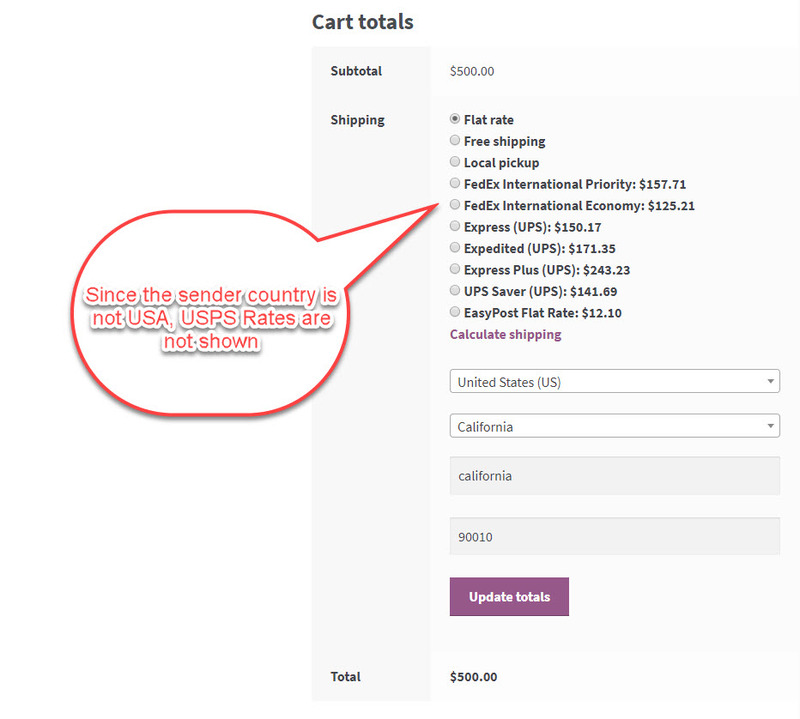 In this case, we have the WooCommerce Default Location as India, and the product is to be shipped from the USA. The customer is in Germany. In this scenario, the plugin return USPS international shipping rate as the product is being shipped from the USA. In normal condition, the plugin will return rates form FedEx and UPS as well, but for that, you need to have a FedEx or UPS account registered from the country your store located. In this case India. This is important as the billing address becomes the basis of FedEx and UPS shipping rates. Most importantly, the EasyPost account’s billing location should be in harmony with the other two independent service providers. Only USPS rates are shown as the billing account registered with our EasyPost account is not similar to the billing location of the WooCommerce default address. All three services should have the same billing address. 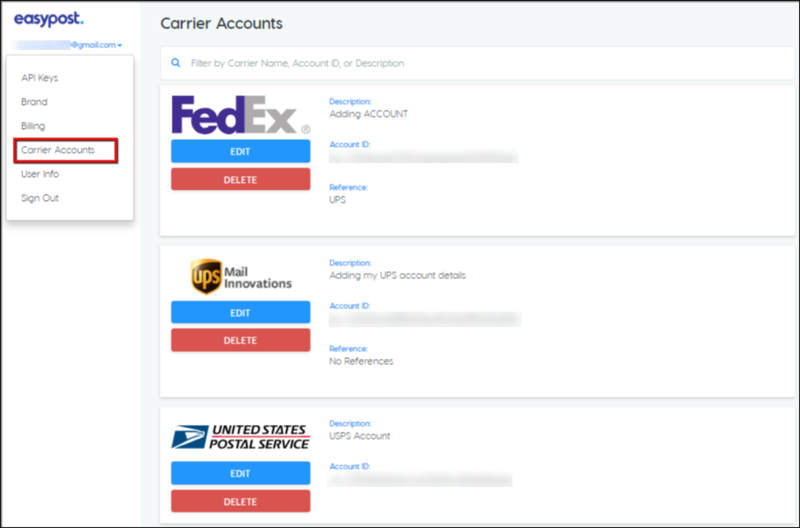 To make it possible, users need to add their FedEx and UPS accounts to their EasyPost Dashboard. To get to your EasyPost Dashboard Sign up for an EasyPost account first. Once you are in the dashboard you can click on your email id on the top left of the dashboard. By doing this you’ll get a drop-down that has the option of EasyPost Carrier account. As you click on that, this right sidebar will show all the carrier options offered by EasyPost. Since the ELEX EasyPost Shipping Method for WooCommerce has the services of FedEx and UPS only, you have to select the specific FedEx and UPS accounts. Each selected service ask for details like Account Number, and, Test and Live API’s receives from the FedEx and UPS. The respective accounts are added only if you add the valid credentials to the form. To obtain your FedEx credential login to your FedEx account or speak to the EasyPost representative. Similarly, UPS credentials can be obtained by signing in to your UPS account. And to connect the EasyPost Shipping Method to your WooCommerce store, enter the API Keys. EasyPost API keys are available on your EasyPost dashboard. You can find it above the ‘carrier accounts’ on the top (screenshot below). Since EasyPost brings together all the important shipping services, it calls for few precautions too. Precautions in the sense that you have valid accounts with FedEx and UPS and subscribed to the right type of account with them. All accounts should be with the same email id to be on the safe side. Name of the account holder should be same. The location mentioned in the respective account should be the same of each account. The billing address in each the account should be same. If you are not from the United States, USPS rates will not be shown. You’ll have access to UPS FedEx rates and services only. Billings for postage and shipping is done from your respective FedEx and UPS accounts. The biggest perk offered by EasyPost is that you get access to highly discounted rates from all the three services. This is not possible when you go for individual accounts with USPS, FedEx, and UPS. All these require you to have a minimum volume of postage consumption to get discounted pricing. In this series of revamping the plugin, the USPS Flat rate boxes are enabled. Earlier there were instances when the flat rate boxes were showing on the cart page, but rates corresponding the flat rate boxes were not shown. This problem is sorted now. And flat rates, which has been a popular, economic and widely used packing option in the entire USA, works fine on the cart page. This is accompanied by fixing of duplicate flat rate box name. Return Labels are the pre-paid and pre-addressed labels that are used by the senders along with the package. These labels are useful as they provide the customers an ability to return the product without paying any extra amount. As you can see that this can be really convenient for customers and adds to customer satisfaction. This function was individually available with stand-alone FedEx and UPS plugins, but EasyPost Shipping Method was not having it. Again, this becomes a part of the plugin due to the addition of the sender country field. You can enable this option from the EasyPost settings. With the addition of sender country location and already available international shipping services, the conversion of weight to ounce was a much need update. Since the plugin is now supposed to be used in different parts of the globe, weight conversion from Kg to Ounce and vice versa has been incorporated into the plugin. Before this release, the plugin had some complaints regarding the compatibility with the shipping services providers and other plugins. This problem has been taken care of too. As of now, the showing of live shipping rates for both the test and live environments has been the best so far. All the three shipping service providers are completely synced. Finally, the unnecessary API calls are removed with the current update, making the plugin faster than ever. ELEX EasyPost Shipping Method for WooCommerce is the next must-have plugin in WooCommerce. Let’s summarize the feature you get with the plugin and how this is going to change the way you execute shipping from within WooCommerce. First, the plugin now lets you ship from all around the globe with its sender country feature and three prominent shipping partners in USPS, FedEx, and UPS. Second, it is fast and reliable as it runs with the advances RESTful API. So you can expect a less interrupted connection with the services provided by the shipping partners. Live shipping rates and tracking performs better with the plugin. The third is the cost. With Easypost, you get the discounted or the business pricing of USPS, FedEx, and UPS with any number of the shipment. And you know that these service providers offer business pricing to high volume shippers only. So it’s a healthy bet to have an EasyPost account. Additionally, the EasyPost Sipping Method provides combined services of three individual plugins. In other words, your spendings on the purchase of three plugins, support, and updates. becomes one-third. There a lot of other features of the plugin presented in the form of its Documentation. If you already have an older version of the plugin and wish to have these features immediately, you can renew your license at 50% off. The renewal gives you all updates and a premium support for the next 365 days. If you are using similar services and use different plugins, you can switch to a one-point solution with EasyPost Shipping Method. Contact our Online Support for any of your pre-sales queries and help.